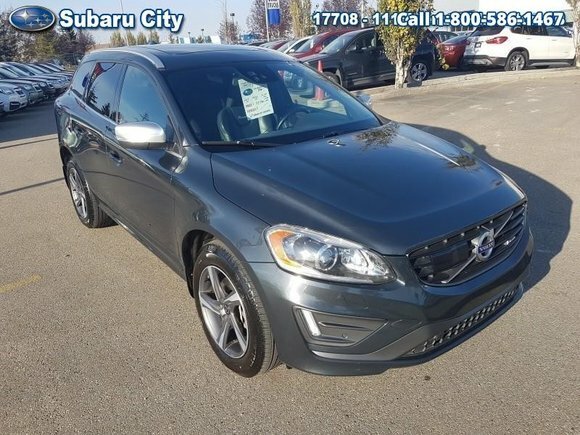 Home > Used Vehicles > 2015 Volvo XC60 T6 R-Design Platinum,LEATHER,SUNROOF,AWD,FULLY LOADED,LOCAL TRADE!!!! 2015 Volvo XC60 T6 R-Design Platinum,LEATHER,SUNROOF,AWD,FULLY LOADED,LOCAL TRADE!!!! Cylinders: 3.0L I6 24V MPFI DOHC Turbo - 6 cyl. On Sale! Save $5953 on this one, we've marked it down from $36900. This 2015 Volvo XC60 is for sale today in Edmonton. The 2015 Volvo XC60 crossover offers a stylish exterior design with a modern interior that's fit for a king. Best of all, those characteristic attributes disguise what is still a sensible vehicle with plenty of family-friendly space and features, complemented by top-notch crash test scores. High quality materials are found throughout this sporty CUV with an attention to detail. This SUV has 82493 kms. It's savile grey metallic in colour. It has an automatic transmission and is powered by a 3.0L I6 24V MPFI DOHC Turbo engine. Buy this vehicle now for the lowest bi-weekly payment of $201.93 with $3332 down for 84 months @ 5.99% APR O.A.C. ( taxes included, $790 Administration and Secure Ride included / Total cost of borrowing $6760 ). See dealer for details. Want to try the 2015 Volvo XC60 T6 R-Design Platinum?